The Civic Society Neighbourhood Planning steering group has met four times since it was set up in January this year. Progress has been made in investigating Neighbourhood Planning and familiarising the members of the steering group with the principles of Neighbourhood Planning established by the Localism Act of 2011. Work is well advanced to establish a preliminary boundary (which may be changed by the Neighbourhood Forum once set up) and in commisioning an independent urban design study. 6th January 2015 - Introduction to Neighbourhood Planning - see HERE for meeting notes. 2nd February 2015 - Planning and Boundary discussion - see HERE for meeting notes. 17th February 2015 - Meeting addressed by Andrew Stunell - see HERE for meeting notes. 10th March 2015 - Meeting addressed by Mick Duggan of Department of Communities and Local Government. Richard Wood (SMBC Planning Policy manager) and Andrew Bispham (deputy chair, Planning & Highways Committee) invited to meeting. - see HERE for meeting notes. Historic England, Chaired by Sir Laurie Magnus, will champion and protect England's historic environment and the English Heritage Trust, chaired by Sir Tim Laurence, will look after the National Heritage Collection. Since Marple Civic Society put forward a campaign for Civic Voice to urge every civic society to nominate at least one "Asset of Community Value" Civic Voice has been championing and promoting "Assets of Community Value". In the past few months, since the start of the campaign, many groups around the country, working with Civic Voice, have developed action plans to nominate "Assets". Not content with nominating one, many groups have nominated dozens! Civic Voice have chosen Marple Civic Society as a case study to demonstrate the different powers available to communities through the Localism Act. The society's planning team has sent a response to Stockport MBC's Planning Department to support Planning Application DC/057081 with conditions. 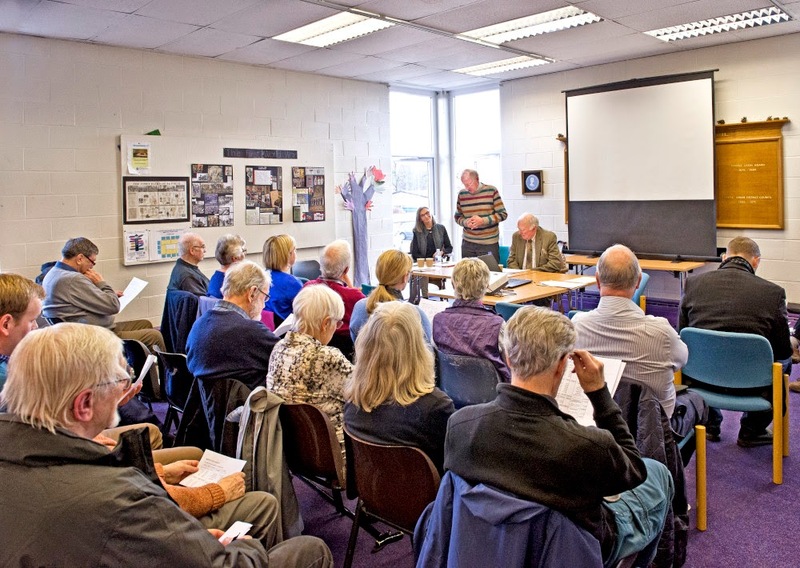 The society's 53rd AGM took place on Tuesday 24th March at Marple library. Chairman Gillian Postill reported a busy year for the society both locally and nationally. She reminded members that the society's most effective tools are its membership and its communication processes. Her report focussed on two key aspects of the society's work: preserving community assets and finding an appropriate regeneration scheme to ensure a viable and vibrant Marple for the future. The two means identified to achieve this are listing "Assets of Community Value" (ACV's) and "Neighbourhood Planning". Both these community powers were created by the Localism Act of 2011. An ACV can be anything that is valued by the local community - open spaces, public buildings, libraries, pubs etc. The first three listings of ACV's are now in place with more in the pipeline. The three main political parties are committed to ACV's and, following lobbying by Civic Voice, it seems likely that the next government will strengthen the legislation, adding greater protection to ACV's. Regarding planning, she said that despite running numerous workshops and public consultations showing substantial support from residents, our call for an independent urban design study to develop a strategy to guide the development of the town centre has met with resistance from decision makers. Last year the society learned that the council's local plan for Marple (the Allocations DPD) has been put on indefinite hold leaving Marple hugely vulnerable. In view of this, she reported that the society has set up a steering group to examine Neighbourhood Planning and to carry out preparatory work with a view to implementing a Neighbourhood Plan. A Neighbourhood Plan allows local residents and businesses to have their own planning policies that reflect their priorities, deliver tangible local benefits and have real weight in planning decisions. Treasurer Gordon Johnson presented the annual accounts. 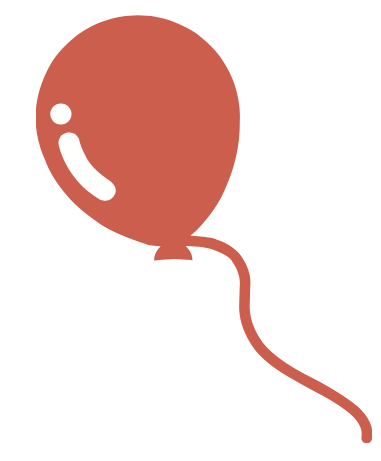 Gordon reported that we had a surplus for the year of £76.46 (compared to £190.47 last year) and the balance of the society's funds is £2480.92 (compared to £2404.46 last year) which is sufficient to fund the society's activities throughout 2015. He paid tribute to Mike Kinder, our honorary examiner for many years, and confirmed that Mike has agreed to continue for the coming year. The election of officers and committee members was followed by a talk by Ian Harvey, Director of Civic Voice. 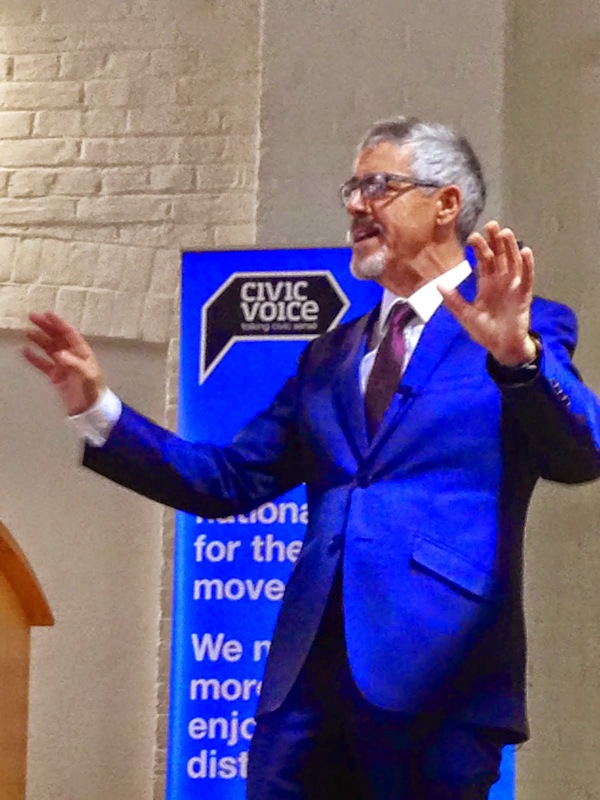 In an inspiring, and frequently amusing, talk Ian spoke about the history of the Civic Movement and his recollections of the formation of Civic Voice five years ago following the demise of the Civic Trust. He went on to talk about the Civic Voice manifesto (Localism for Real), the first in the Civic Movements history, which proposes measures to achieve real local input to the shaping of our towns and villages, and collaborative planning (Collaborative Planning for All) to bring collaborative processes into mainstream planning. He emphasised the grassroots approach of Civic Voice using the example of the campaign to register "Assets of Community Value". This campaign was proposed by Marple Civic Society at the Civic Voice AGM in November 2014 and was subsequently adopted by Civic Voice. Since then the campaign has led to a huge surge in registrations nationally. We are looking forward to seeing members and friends at our 53rd AGM on Tuesday 24th March 2015. The Chairman's Report and Trustees Annual Report will provide a summary of the society's work over the last year and provide an important update on progress towards a Neighbourhood Plan for Marple. The Business meeting starts at 3.00pm and light refreshments will be served at approximately 3.40pm. We will then welcome our speaker Ian Harvey, Executive Director of Civic Voice, the national charity for the Civic Movement in England. Come along and hear Ian speak about his role with Civic Voice, their campaigns for 2015 and their relevance to us here in Marple. 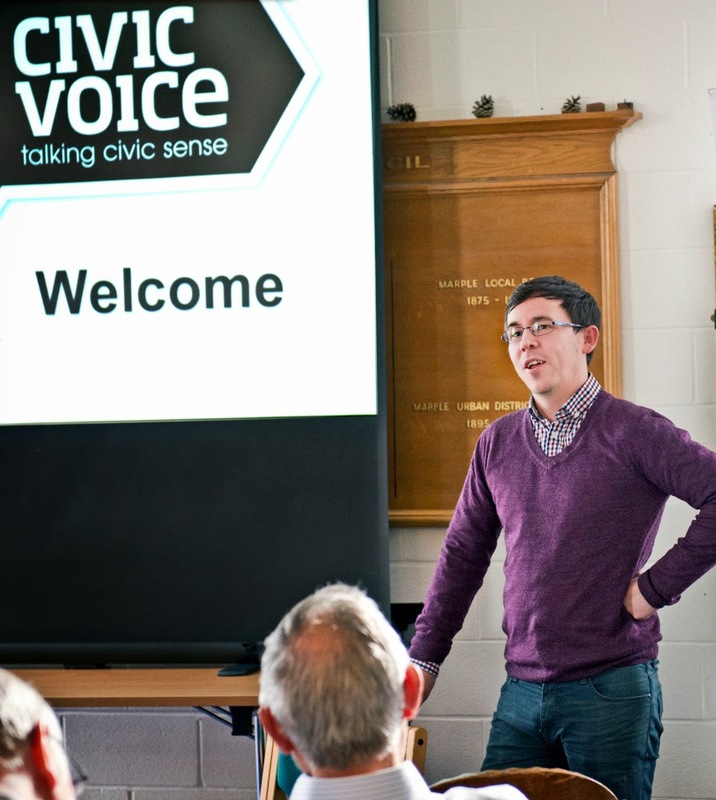 Civic Voice has been particularly active in the lead up to the General Election seeking support for their first Manifesto and lobbying hard on important civic issues particularly regarding participation of local people at an early stage of the planning process. We hope to see you on Tuesday 24th March, family friends and neighbours are welcome too. Two more Assets of Community Value have been listed: Brabyns Park and the Travellers Call pub on Glossop Road, Marple Bridge. Civic Voice has joined with the Campaign to Protect Rural England (CPRE) and the National Association of Local Councils (NALC) to call on all political parties to make a firm manifesto commitment to introduce a "community right of appeal" into the planning system. even when they are not in line with communities aspirations for the area. The call was made at the Liberal Democrat Spring Conference where the three organisations have joined with Liberal Democrat MP Martin Hopwood MP to hold a debate on the benefits of such a right. Sadly, Marple does not have a Local Plan (Allocations Plan) and isn't likely to have one any time soon, hence the need to progress the Civic Society proposal for the community's own Neighbourhood Plan. 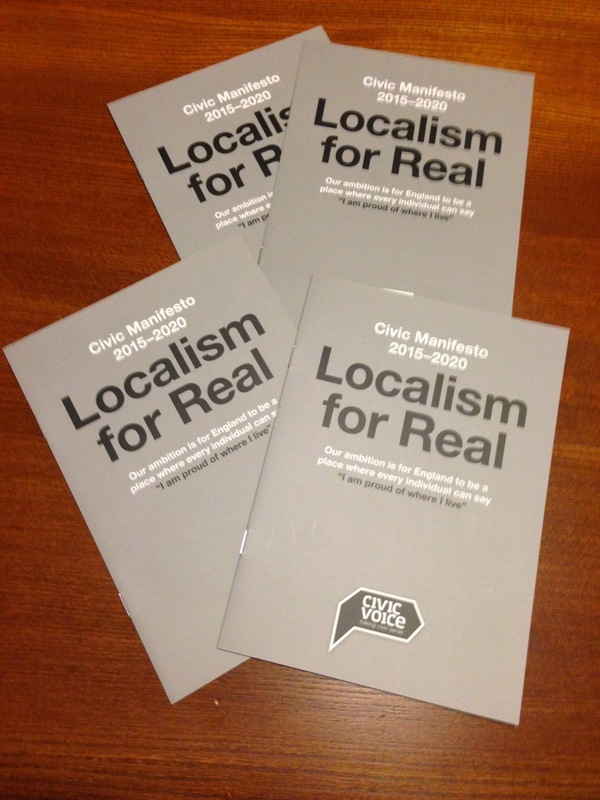 Civic Voice has asked Civic Societies throughout England to lobby General Election candidates and local councillors to support the Civic Voice manifesto 2015-2020. Give local communities the powers they need to enable their city, town and village centres to prosper. Andrew Stunell MP - Local MP and patron of the Civic Society gave strong uneqivocal support. Lisa Smart - LibDem parliamentary candidate gave her full support. William Wragg - Conservative parliamentary candidate gave the manifesto his full support. Michael Taylor - Labour parliamentary candidate gave his full support. 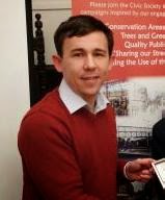 Darren Palmer- UKIP parliamentary candidate agreed to respond positively but to date no written response received. Cllr Sue Ingham - Councillor Marple South gave her wholehearted support. Cllr. Andrew Bispham - Councillor Marple North felt he could not support the manifesto. Cllr Martin Candler - Councillor Marple North gave no response. Cllr. Shan Alexander - Councillor Marple South had reservations about the manifesto. Cllr. Kevin Dowling - Councillor Marple South supported the Manifesto in principle but found some nuances that he could not support. Marple Civic Society supports the 'Revealing Oldknow's Legacy' HLF project and is represented on the project stakeholder group . 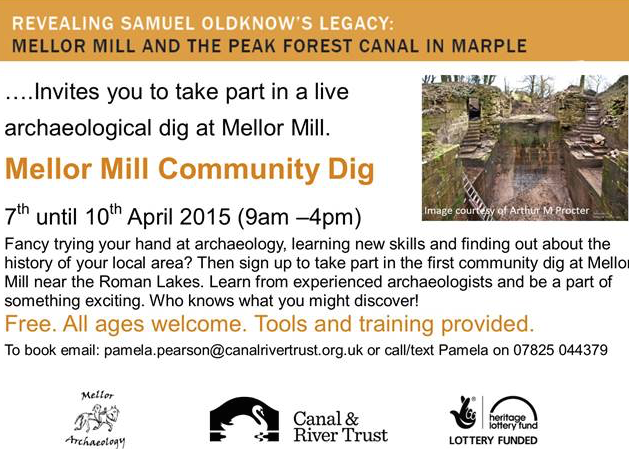 The first community dig of the project will take place at the Mellor Mill site 7th - 10th April. It's a free event and everyone is welcome. Tools and training provided. See poster for further details.